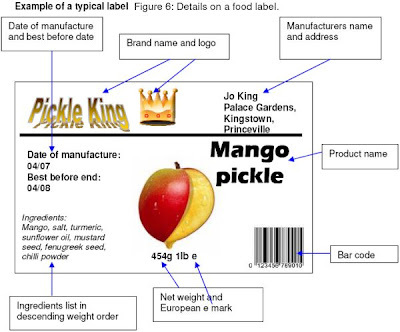 Labeling is an important process in the food processing chain and should not be overlooked. The label is the first point of contact between a consumer and the producer. It is used to identify one product from another and also to make a decision over which product to purchase. The label is therefore the most important marketing tool for a product. It should be attractive and eye catching while at the same time being informative. A dirty, confused, untidy label will not help to sell a product. Small scale food processors should aim to label their products with the best label they can obtain or afford in relation to the value of the product. What should I include on a label? As a good starting point, remember “the less the better”. As long as you meet all the minimum legal requirements for the particular food product and the country you are selling in, you should not include too much more. If the label looks cluttered and untidy, it will give the product a negative image. Net weight of product in the package. The brand – it is optional to include a brand logo, but in terms of marketing your product and establishing your brand in the market place, it is important to define and include a brand logo. That way the consumer will quickly be able to find your products and come back to buy them. All food products should be labeled. The type of label used varies according to the type of product, the packaging container, individual preferences and local availability of labels. The most common (and cheapest) type of label is the paper label that is glued onto the container. Self-adhesive labels are also available but may be more expensive. Paper labels are made out of plain paper. The information can be written by hand, or it may be printed if this facility is available. The labels are glued and applied to the containers by hand. 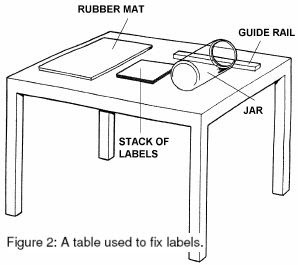 The best way to apply these labels is to have a guide rail affixed to the work surface. The pile of labels is placed face down beneath the guide rail. The top label is glued and the container is rolled over the label, with the top pressed up to the guide rail. The container is then rolled over a rubber mat, to firmly press the label onto the container. Figure 3 shows a simple frame that can help in this operation. Labeling equipment is available to apply the labels more quickly and to give a better finish. Water soluble glues such as starch or cellulose based glues are best for returnable containers, allowing labels to be removed easily. Water soluble glues can loose adhesion in humid climates so non water-soluble glues, made from plastic polymers, can be used. Self-adhesive labels are already gummed and just need to be stuck onto the container. Care should still be taken to ensure the label is applied neatly. 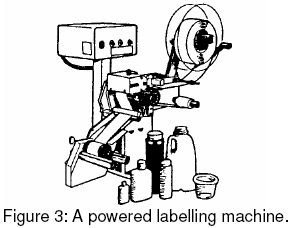 Small labeling machines are available that can apply the labels to the product. The type shown in Figure 4 can apply 30-40 labels per minute. If a range of products is being produced it is possible to use a common label design that can then be adapted for each product line. For smaller producers this helps keep the design and print costs down. There should be some standard artwork or brand image and standard information on the manufacturer can be included with a blank area left for further information about the product to be added at a later stage. The product can be identified either by writing on the label or by using stickers containing the relevant information. The design of a label and the quality of the paper or other materials that are used is of critical importance in promoting the product. In general a simple, uncluttered image on the label is better than a complex design. The brand name or the name of the company should stand out clearly and if pictures are used, they should be an accurate representation of the product or its main raw material. Color can be used to produce either a realistic picture (full color printing) or blocks of one or two bold colors to emphasize a particular feature. Care is needed when choosing colors as they are culturally very significant and have a direct effect on peoples’ perceptions of the product. For example, in many societies white is associated with death, whereas in others, it is red or black. In some areas, browns, ochre and greens are associated with ‘nature’ or natural unprocessed products, with an image of health and good quality. In others, bright oranges and yellows can either mean excitement or cheap, low quality products. In view of the importance of labels, producers should pay the highest price that they can afford to obtain the best possible quality. Professional designers or graphic artists may be located at universities, art schools or in commercial agencies and these should be employed to produce a range of ideas. These can then be discussed with the Bureau of Standards and then a printer to obtain quotations before a final decision is made. Most printers require a print run of several thousand labels and great care should be taken to check the design for errors before printing, as these would be very costly and time consuming to correct during production. 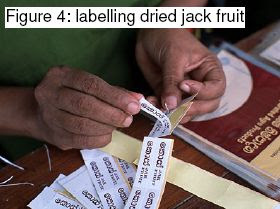 In some countries, food producers can be prosecuted if their label is incorrectly designed. It is in the processors’ interest to involve the local Bureau of Standards at an early stage of label design to ensure that the label meets all local requirements. specifications of the way in which certain words such as flavor, fresh, vitamin etc. can be used. This is a complex area, which varies from one country to another. Professional advice should be sought from the local Bureau of Standards to ensure that local standards and regulations are met. Date of Manufacture means the date on which the food becomes the product as described. 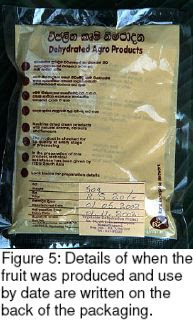 Date of Packaging means the date on which the food is placed in the immediate container in which it will be ultimately sold. Sell-by-Date means the last date of offer for sale to the consumer after which there remains a reasonable storage period in the home. Date of Minimum Durability (“best before”) means the date which signifies the end of the period under any stated storage conditions during which the product will remain fully marketable and will retain any specific qualities for which tacit or express claims have been made. However, beyond the date the food may still be perfectly satisfactory. Use-by Date (Recommended Last Consumption Date, Expiration Date) means the date which signifies the end of the estimated period under any stated storage conditions, after which the product probably will not have the quality attributes normally expected by the consumers. After this date, the food should not be regarded as marketable. Ingredient means any substance, including a food additive, used in the manufacture or preparation of a food and present in the final product although possibly in a modified form. Label means any tag, brand, mark, pictorial or other descriptive matter, written, printed, stenciled, marked, embossed or impressed on, or attached to, a container of food. Labeling includes any written, printed or graphic matter that is present on the label, accompanies the food, or is displayed near the food, including that for the purpose of promoting its sale or disposal.